Last week I studied the well-known Bible passage in John 6 that records Jesus feeding five thousand people with a little boy’s lunch. One of the things I love about God’s Word is that no matter how many times I read it or study it God will speak fresh truth when I have ears to hear, eyes to see, and a heart to understand. I can’t help it…I just think it’s the most wonderful thing. “When Jesus looked up and saw a great crowd coming toward Him, He said to Philip, ‘Where shall we buy bread for these people to eat?’ He asked this only to test him, for He already had in mind what He was going to do. Back in January I wrote the post, The Dream-Believer. I mentioned that God had given me a dream and one day it would be time to share it. As I studied this passage with eyes wide open, ears unplugged and a heart eager to receive I realized it’s time to share my dream. I’ve written a devotion book. It chronicles my spiritual journey through simple, every day experiences. Like a journal. I’ve written what I feel as honestly as I can, recording ways God has touched me, inspired me, encouraged me, and convicted me. These thirty devotions have been illustrated by my friend, Sherry French, who is a talented mixed media artist. This past January I was offered a contract from a Christian publishing company and I accepted. The book is now in production with an expected fall release. You’d think I’d be elated. Excited. Expectant. You would think, but to tell you the honest-to-goodness truth I’ve been very scared. Waves of fear have washed over me. Failure. Faint-hearted. Faithless. Fiery f’s. Flaming darts of the enemy. Doubt. Discouragement. Dread. Deadly d’s. Unbelief. Uncertain. Unable. Unforgiving u’s. And what if no one buys the book or those that do feel they wasted their money after they read it? What if the first run of a thousand copies sits in the warehouse collecting dust? What if I never get to write another book? Whiny what-if’s. Does it never end? Shortly after I signed the contract on this book-a book I know for certain was completely and totally inspired by God-I realized that all my fears were a lack of faith in Him to use the gift of words He has given me. A lack of faith in His power. His might. His work. His ability. We’ve all been given a few loaves and a few fish…something or somethings…a gift or two that God never intends for us to keep to ourselves. These somethings are given for us to share, to shine, to show the faithfulness of God. We’ve heard it over and over again….it’s not about me…it’s all about Him. Isn’t it time we lived it? Months ago, when I realized God was increasing my faith through the publishing of this book, I determined to ask Him to sell five thousand copies. Oh, I know He can sell more than that, but I’m just an unknown author with a little gift to share. A few words to shine the light of Jesus. A testimony to show God’s faithfulness in my life. When I pondered over this story of the boy who gave all he had, I realized God wants to feed five thousand people with my little lunch. Five loaves. Two fish. Five thousand people. And all are fed. It’s a God-thing. A miracle. A multiplying. 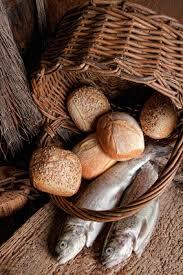 When I give God my five loaves and two fish it will always be enough. More than enough. There may even be leftovers. Nothing I give in Jesus’ name will ever be wasted. So I’ve surrendered my little girl’s lunch…this devotion book…because it’s not mine. It’s God’s. He’ll feed the five thousand. I’ll just pray each one is filled. When the fiery f’s, the deadly d’s, and the whiny what-if’s threaten to scare me silly Jesus reminds me this isn’t a Nina-thing. It’s a God-thing. Sometimes I’m still like a child, a girl surrendering her basket full of somethings, but I know I’m never too old for miracles. All the somethings I have to give for all the days of my life will never be wasted in the hands of the Multiplier. And that’s such a wonderful thing.